A friend recently blogged about Kristin Lavransdattar, which gave me the idea for my next focus post. 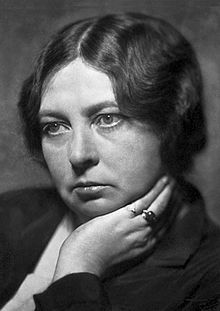 Although Sigrid Undset is known mostly for that powerful depiction of of medieval life in Norway, she was also the author of contemporary realistic novels. Her novels written later in life were informed by her conversion to Catholicism. She is one of only three Norwegian authors to receive the Nobel Prize for Literature. Unset was the daughter of a well-known archaeologist whose specialty was the Iron Age. Her father died when she was 11. Her Wikipedia entry says that the family’s financial situation after his death was the reason she had no university education, but in the Nobel Prize biography, which appears to have been written by Undset herself, she says that she was assured her education but had no interest in school and decided not to pursue it. At the age of 16, she took a job working in an office but wrote at night. She had the manuscript for Kristin Lavransdattar finished by the age of 22, but it was rejected by the publisher. After she worked at the office for ten years, she decided she was wasting her life and quit her job. She went on to write modern realistic novels, finally getting one published when she was 25. She married a Norwegian painter when she was 30 and moved from Kristiania, where she had lived most of her life, to Lillehammer after having her third child. During World War II, she was forced to leave Norway for the United States, but she continued to support the resistance movement against the Nazis. When she returned to her country after the way, she received the Grand Cross of St. Olav for her writing and patriotic contributions to Norway. Next ›Did You Finish Your Spin? Thanks for the post. Another fan of the trilogy here. I did like it, and it is a book that grows on you. I loved Kristin Lavransdatter many years ago, and right now I have a collection of four Undset stories waiting for me…thanks for this post! For anyone not quite up to 1000-page task of Kristin Lavransdatter, I highly recommend Gunnar’s Daughter. A gut-wrenching sorrow. Oh, thanks! I haven’t run into that one. Great! I’ve seen a few people read her books lately, too, which is why I picked her.